Confused whether to buy OnePlus 6 or iPhone X? OnePlus 6 is loaded with high-end specifications and comes with an affordable pricing than a lot of other flagship phones. The iPhone X sits in our best phone category but it is going to cost you a lot more money if you decide to have one. 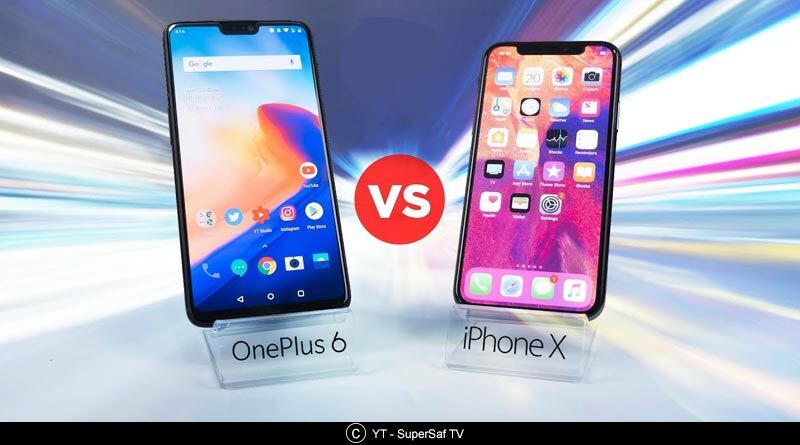 Let us compare these two models on the basis of specifications, design, price and much more so that you can decide whether to buy OnePlus 6 or iPhone X. Both the OnePlus and iPhone X have glass backs with metal edges but that is where the similarities end. The OnePlus 6 is a little bit bigger than the iPhone X. The bigger display properties and a touch heavier weight is what distinguishes OnePlus 6 from iPhone X. The OnePlus 6 comes with different choices of mirror black, midnight black or silk white while the iPhone X is restricted to plain white or black color choices.OnePlus 6 has a fingerprint sensor on the rear which is missing in iPhone X.
OnePlus 6 comes with 6.28-inch optic AMOLED display with a full HD+ resolution. The Super AMOLED display on the iPhone X is smaller at 5.8 inches, but it has great resolution properties of 1125*2436. If you want a phone with a larger screen, then OnePlus 6 is the right choice otherwise iPhone X has a higher resolution display. There is a huge difference in the pricing when you want to compare OnePlus 6 and iPhone X. OnePlus 6 is priced at Rs. 35,000 whereas an iPhone X costs more than double the pricing at Rs. 85,000. OnePlus 6 comes with latest Android 8.1 Oreo software with the company’s own Oxygen OS UI running over the top.OnePlus also provides support for OS updates for least a couple of years. The iPhone X is running on the latest iOS 11 software which you will be used to if you are well equipped with iPhones.The performance of an iPhone may not be as powerful as OnePlus 6 so you can go for OnePlus 6 any given day. The iPhone X comes with 2716mAh cell that supports fast charging and will go up to 50% full in just 30 minutes of charging. Apple’s iPhone X features wireless charging which OnePlus 6 does not support.